Article by: Craig Wheeler: Downey, Calif. I have Gilligan's Island on DVD and have recently bought a 65" DLP Television. The quality is amazing! While watching the third season of GI, I thought to myself, "I know they filmed the harbor sequence at Marina Del Rey, in California, for seasons two and three." We see close ups of the Minnow, but surely, the Minnow should be visible in the first opening shot. 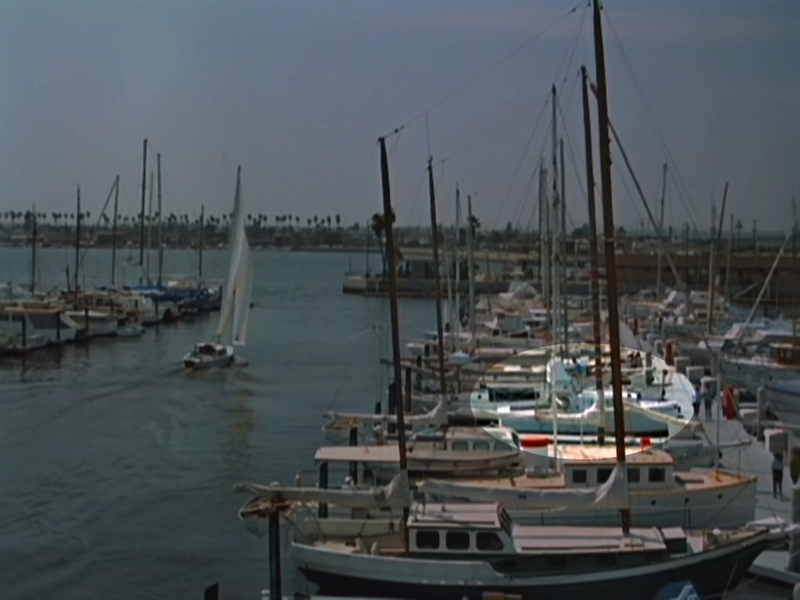 After studying the surrounding boats around Skipper and Gilligan, and the building in the background - I have found the Minnow in the opening wide shot of the harbor. Below is a screen capture and I hi-lighted the Minnow. You can even see a likely double for the skipper standing on the Minnow! I can't make out the people on the dock nearby. Have you noticed how there is no boat docked on the Minnow's starboard side? I'm sure this was done intentionally, so that you can see the Minnow, otherwise it would be blocked from view. Also, remember what you see in this shot is the same setup that is used in the close up in the next frame (not shown). Again, no boat docked next to the Minnow, so that we can see it. I hope I made sense. I have never read where anyone has mentioned this before. Thought I'd share it with you.